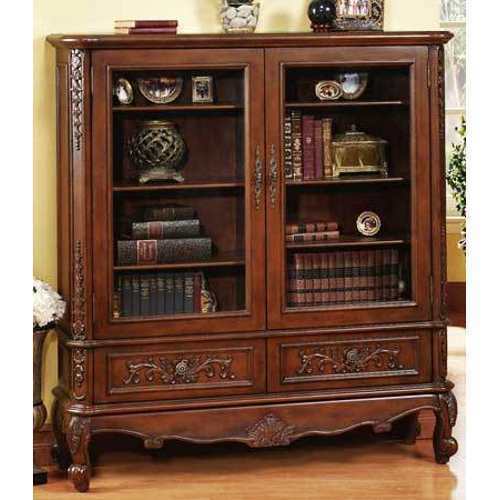 We are engaged in offering Wooden Bookcase, which is is known for high quality level and durability. Our handmade wooden curved furniture is available with us in different sizes and shapes and can be further custom made as per the requirements of the customers. Backed by rich industrial experience, we are a recognized name in the market in the domain of Manufacturing, Exporting and Supplying Furniture Products. The range of our industrial products includes Wooden Furniture, Wooden Carved Furniture, Wooden Bedside Tables, Wooden Dining Table Set, Wooden TV Cabinet, Wood Carved Sofas, Wooden Bookcase, Wooden Carved Table, Carved Furniture, Wooden Beds, Wooden Wardrobe, Wooden TV Cabinet, Coffee Table, Ceramic Table, Wooden Wine Cabinet, Wooden Wine Rack, Shoe Rack, Wooden Antique Sofa and Brass Fitted Furniture. Manufactured using fine grade wood and brass procured from reliable and certified vendors across the nation, these are known for high finesse, dimensional accuracy, design and sturdy construction. Our team is engaged in manufacturing only quality products thereby expanding the market for our products. Complying with industry standards and adopting ethical business policies, we have garnered a huge network of clients that lay their faith in us and build an association with us after using our quality products. With the help of the huge infrastructure that the company has, we have been able to enhance the quality and rate of production by using state-of-the-art technology and advance techniques deployed for the team. Maximizing client’s satisfaction by the quality of products and on time delivery, we also focus on the pricing policy and customization.